U2's new album: What will it sound like? Yesterday U2 officially announced a release date for their 12th studio album, No Line On The Horizon. The record, which at one time was thought to be released last month, will be issued on 2 March 2009 (the US gets a 3 March release). "There is some dark, heavy stuff but there are also some lighter things," The Edge said in a recent interview. "Some we've really had to sweat to get and some just came so easily." The sessions for No Line On The Horizon took place mostly in Dublin and New York, but a brief visit to Fez, Morocco yielded tracks that The Edge calls "religious sounding." Still, the guitarist stressed that the group didn't want to be "musical tourists," and of the trip itself, he said, "We came back with a certain flavour and influence and a sense of freedom." It's common knowledge that The Edge is something of a gadget guy. Give him a new device and he'll find a way to write a song with it. No Line On The Horizon sees this trend continue, with the addition of a funky little stomp box called the Supersonic Fuzz Gun by a company called Death By Audio. The Edge describes the effect as "kind of 21st Century distortion," and indeed, the sounds are freaky and immense. The guitarist has said he utilized the Supersonic Fuzz Gun on the title track. "Guitar is such a versatile instrument, but it's very easy to get in a cul-de-sac in terms of how it sounds," Edge told Mojo magazine. "I love anything that just gives it a different personality and this particular set of distortion pedals I think, are a different colour. It's like a different personality and that, for me, is a great jumping-off point." 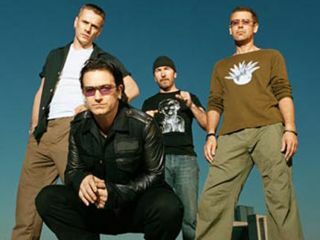 Not that anybody would expect him to call the album a pile of inner tubes, but producer Daniel Lanois, not one given to hyperbole, has said that No Line On The Horizon is "fantastically innovative" and that the album represents "some of U2's best work." Not too shabby. "Rock 'n' roll has been reinvented one more time," Lanois continued. "I think Bono's lyrics and vocal performances are better than ever. I'm glad to see he's stepping up and talking about what's on his mind." It's been a long road, though: Early sessions with producer Rick Rubin were scrapped and it was eventually decided that the band would again work with Lanois and Eno, with Lillywhite pitching in as well. In the fall, Interscope-A&M-Geffen chairman Jimmy Iovine (who has produced U2 and other artists in the past), paid the band a visit to hear what he thought would be the nearly finished album. It was then that the group told him that they felt they were two songs short of a masterpiece. "It's a great record, but it deserves the time," said Iovine, who backed the band's decision to continue recording. "Labels need to work with artists to help them achieve their best work, not to jam records out that are half-baked or three-quarters baked." Whether of not U2 finished baking those two new songs in London isn't known as of yet, but they have spent the past month mixing the record at Olympic Studios. And a recent claim by Kanye West that wil.i.am from the Black Eyed Peas is "producing on U2's next album" has turned out to be nothing more than Auto-Tuned rumor. So, what to make of No Line On The Horizon? With a release date of early March, we should be hearing a first single sometime in January. We at MusicRadar eagerly await what should be one of the most exciting albums of 2009.